The disposal of waste tires represents a great environmental and economic problem throughout the world. Pyrolysis seems to be a good way of waste tire disposal, because it significantly reduces the volume of the waste, and also allows recovering of valuable materials. Additional treatment is sometimes needed to improve their qualities. In our case, the microwave (MW) plasma beneficiation of the pyrolytic carbon is applied to remove the volatile components causing its bad smell, and to make it reusable for other processes, e.g. it could be used as a colouring agent for plastic materials or as an adsorbent. We use Litmas Red MW plasma torch, which is able to generate atmospheric pressure near-equilibrium plasma in various gases with temperatures of 1000-5000 K. MW plasma in nitrogen was used for waste carbon treatment. 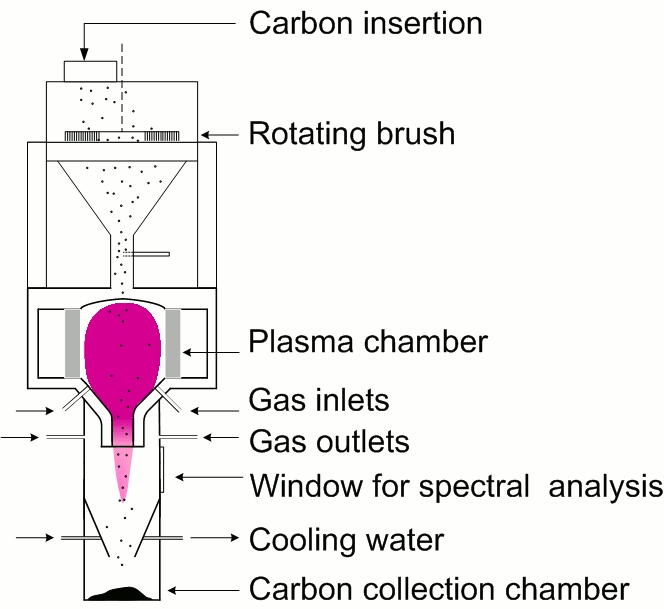 In the first approach, the carbon sample was placed on a stainless steel plate in the plasma plume about 1 cm above the nozzle (Fig. 1). Approximate temperature of the plate, measured by a pyrometer, was 1500 K. The system was closed and exhausted because of possibly dangerous gases being emitted from polluted carbon samples. The carbon samples were heated for 5 or 10 minutes in nitrogen plasma of 13 l/min flow rate and 1.4 kW generator power. After plasma being switched off, the sample was cooled at a low N2 flow 2 l/min to avoid oxidation. 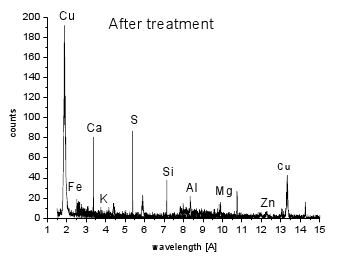 The diagnostics of carbon samples was performed directly by a scanning electron microscope (SEM) Tescan TS5136MM equipped with wavelength dispersive X-ray (WDX) INCA Wave analyzer, and on KBr pellets analyzed by Fourier-transform infrared (FTIR) spectrometer Perkin Elmer Spectrum BX. In the second approach (Fig. 2), the waste carbon samples are continuously inserted directly into the plasma chamber, where the temperature is considerably higher compared to the first approach. The plasma temperature, determined as the rotational temperature by comparing experimental and simulated (LIFBASE) CN spectra, was 4500±250 K and 1.78 kW magnetron power and 4000±250 K at 1.46 kW, both at 15 l/min gas flow rate. Fig. 1.Carbon sample treatment on a stainless steel plate in the plasma plume about 1 cm above the nozzle. Fig. 2.Direct treatment of carbon sample. In this arrangement, the treated carbon (Fig. 3) was also in a direct contact with radicals and active species generated in the plasma. 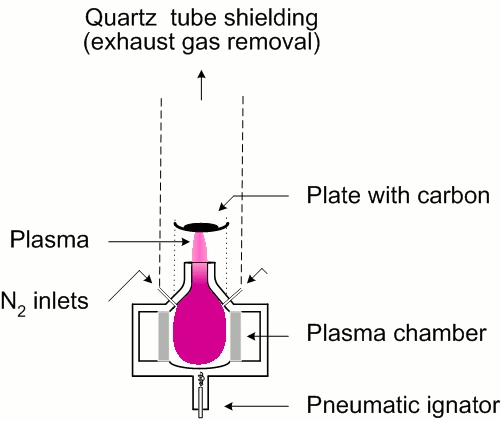 The whole system, including the plasma plume, was turned upside down to enable the collection of the treated carbon powder below the plasma chamber. The carbon collection chamber was water-cooled. It also enabled on-line emission spectroscopic analysis through the quartz window. After plasma heating of the carbon samples there was no smell detectable and their mass decreased. 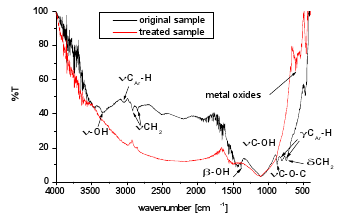 Some volatile substances, most likely aliphatic and aromatic hydrocarbons and their –OH and ether derivates were released from the carbon, which was confirmed by FTIR spectra (Fig. 4). An apparent reduction of CH2, C-O-C, -OH, and aromatic C-H functional groups was observed. On the other hand, new compounds were created. We assume them to be metal oxides of trace elements found by WDX analysis. Fig. 3. 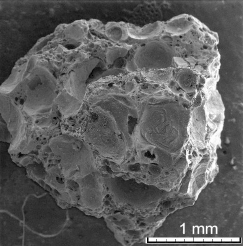 SEM picture of carbon sample before treatment. Fig. 4. 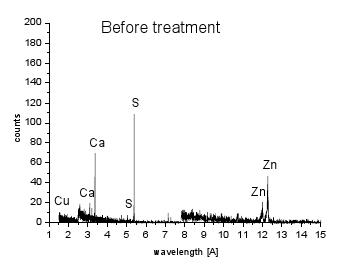 FTIR spectra of carbon samples. WDX analysis (Fig. 5) demonstrated C as a dominant element with trace amounts of S, Ca and Zn found in the original carbon sample and decreased after the heating. On the other hand, new elements, such as Fe, Al, Si, K, Mg were found. We assume that some of these metals were released from the stainless steel plate during the heating (Fe, Si). Cu is from the supporting tape used during SEM analysis. Fig. 5. WDX analysis of carbon samples before and after treatment.